The VigiExpo project funded by ANSES (French Agency for Food, Environmental and Occupational Health and Safety) within the framework of the research National plan Environment-Health Work. A collaboration between Centre Scientifique et Technique du Bâtiment (CSTB), XLIM laboratory (CNRS UMR 72522) and Geomod. The goal of the VigiExpo project is to develop a standalone monitoring system of population exposure to electromagnetic field generated by mobile telephony base stations antennas. Exposure levels have to be estimated at any point of a given geographical area. Numerical modelling of the exposure levels allows an analysis of exposure on a large scale and at any place. This is complementary to measurements which are always temporally and spatially localised. One of the major difficulties in the production of exposure maps is the knowledge of the precise characteristics of the transmitters in base stations antennas: exact position, power, radiation patterns. Some partial information is available in the public domain, such as the website Cartoradio in France maintained by ANFR (French National Agengy for Frequencies). This information is both partial and imprecise and mandatory parameters for simulation are lacking. In the VigiExpo project, we combine simulation with georeferenced receiver power levels data measurements on set of smartphones. The simultaneous and complementary use of data from smartphones and simulations allows by backward optimization and statistical processing to fit the missing characteristics of the transmitters. As a consequence dynamics maps of people’s exposure at the scale of a neighborhood can be built. Simultaneous route with two different smartphones – GPS data comparison (left) and power level received from a UMTS transmitter (right). Visualization in Google Earth. 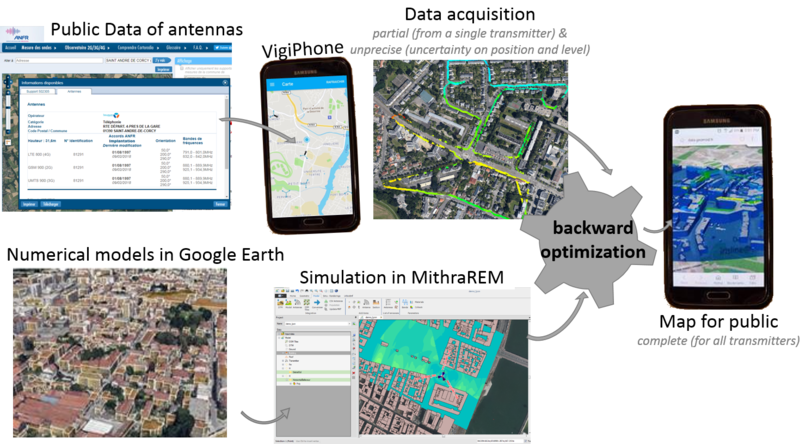 The monitoring tool is based on an Android application developed by the CSTB (VigiPhone), associated with the simulation software for the propagation of electromagnetic fields (MithraREM) and an optimization algorithm to go back to the precise characteristics of transmitters.The VigiPhone application collects georeferenced received power level. By networking these data and the appropriate optimization algorithm it is possible to complete the numerical modeling and thus to build dynamic maps of the exposure of people at the scale of a neighborhood. A genetic algorithm has be developed to fit the parameters of the transmitters, so as to make the EMF levels modeled by simulation as coherent as possible with the georeferenced information collected by the smartphones. We use link indicators (Pearson and Spearman correlation) and error indicatos to find the global (minimum / maximum) extremum in a large solution space explored by the algorithm (precision position, databases of radiation patterns, radiated power). The mutation and corssover methods used by the algorithm have been designed and validated to ensure good reproducibility and stability of the results (systematic convegence towards the real parameters and the physical solution). The newest version of XPDrainage is now available !